Since the 25th of January and I've been living in a roller coaster. A continuous series of ups and downs every moment. I didn't participate in the first day of the revolution. I was a bit scared, a bit not convinced that it will change anything, and also I prefer to follow such events on twitter and facebook instead of participating in them. Then protesters were killed by the security forces even though the protesters insisted that it will remain a peaceful protest. Two days later, the government switched off the mobile phones, the internet, blackberry, and all other means of communication. They thought that they might prevent people from communicating and arranging for further demonstrations. But the truth is that such information blackout made me - as well as thousands of other people - eager more to get down to the streets and participate in the "Friday of Anger". Again, the police brutality didn't stop. Rubber bullets, tear bomb, and even lethal bullets were used in different places in Egypt. 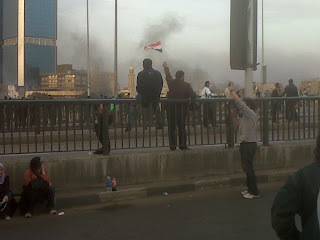 They were doing their best to prevent the protesters from crossing the bridges and going to Tahrir square. We tried different bridges in different areas, but we faced the same resistance from the police, till a curfew was announced and I preferred to go back to home, along with many others. Later on, on news channels, we found out that police was defeated and people succeeded in crossing to down town, where Tahrir square is located. Later on, news from here and there claimed that the police left their locations on purpose, they unlocked the prisons for looters to go to the streets and terrify people, and some people on TV even claimed that the police and (NDP) National Democratic Party's militias participated in terrorizing people. With the high death toll, the pressure of the United States as well as many other international entities on the government, we expected the president to resign. They announced that Mubarak will give a speech in a while, but it was delayed for hours. And during those hours every one was sure that he was preparing himself to resign. Then came the speech, and he said nothing but changing his prime minister! Then came Tuesday, and at least million persons went to demonstrate in down town. By the way, let's wait for more photos taken by people that day as they will better portray it than words. Also thousands of protesters went in other places in Egypt. And by the night, after seeing those huge numbers in the streets, people were sure that Mubarak will give another speech. They were sure of seeing the speech, yet they were not very sure of its content. Lots of them were expecting him to finally resign, yet some other were suspicious. And once more, I experienced Mubarak's roller coaster. I was happy after his speech. Although he didn't resign, but he promised not to run in the following presidential elections and promised to let the parliament fix the parts of the constitution that limit the presidential candidates to the members of the NDP or the ones approved by the party only. But after a while, I found myself wondering, isn't this just another manoeuvre by the president. Almost all of the members of the parliament are from the NDP, so no one can be sure that they will really fix anything. Also, after the speech, we found demonstrations everywhere in support for the president and asking him to stay in charge. Such kind of suspicious pre-organized demonstrations along with those suspicious people who started calling the different TV shows, weeping and asking the president to stay. The president didn't call for a trial for those in the Ministry of Interior for their role in all this mess and chaos. All this made me suspicious of what have just been said in the speech. I'm still confused. I really can't tell if the revolvers have achieved at least a significant part of their demands, or the revolution was murdered. I am not the only one confused here, many protesters are confused too. Some are saying that they have to stay and calling for another demonstration next Friday, and some others are calling people to get back to their homes end those protests altogether. Nothing is sure yet, but I am just sure of one single thing, Egypt has changed. 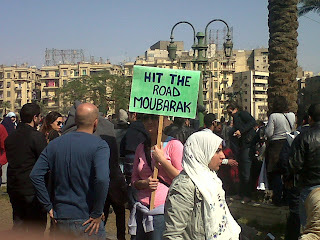 I still remember that poor lady I met in Tahrir who said something that summed the whole thing in few simple words. She told me, "A couple of days ago I was so scared of every single police soldier, and today I am here protesting against the head of the state". 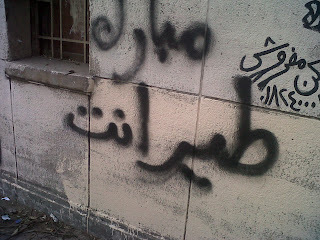 Update: The pro-Mubarak demonstrators/militia started now to attack the protesters in down town! Update: Photos from the past few days. What u people are doing incredibly brave. You succeeded in getting people to listen and most importantly CHANGE. No one thought Mubarak will respond so fast and we certainly didn't expect him to resign without a fight. But we are worried that he may leave the country in a big chaos behind him. Our hearts are with you. We love you Egypt! I've been reading about the situation day by day thanks to GVO. You have a very good review of the events here. What moves me the most is that you are not afraid anymore. The power of the people, right? I read the police stole the medical supplies you were trying to take to the injured. Do you have a Paypal account so I can donate to you so you can buy some more?